The destruction was evident in a short visit to the area organized for reporters. 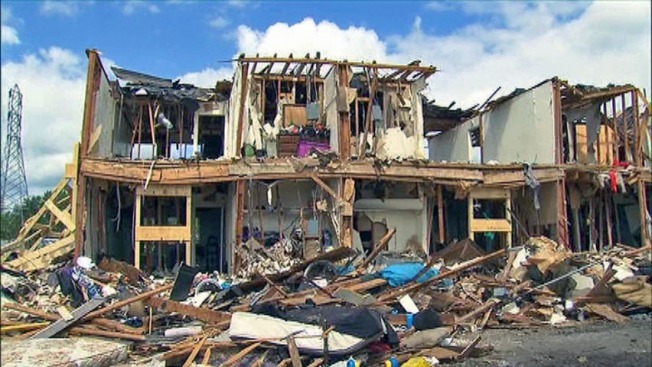 In a news conference Monday, officials declared safe the neighborhood around the site of last week's deadly West, Texas, fertilizer plant blast, which was so powerful it registered as a small earthquake and left a large crater. Still, public services will not be restored for several weeks, officials said, and they have not yet identified what caused the blast. Meanwhile, as the town struggles to recover, the White House said Monday that President Barack Obama is planning to attend a memorial service for first responders scheduled for Thursday on the campus of Baylor University in nearby Waco. Last week's explosion killed 14 people, wounded 200 others, destroyed about 50 homes and severely damaged a nursing home and other buildings nearby. It reportedly killed 10 first responders, many of them volunteer firefighters who came after initial reports of a fire at the plant. Preliminary reports indicate the infrastructure to the town was severely damaged and that further assessment is underway to determine just how significant that damage may be, city officials said Monday afternoon. Due to the damage, officials said a boil water notice is in place for all of West, likely for the next few weeks, and that those without water service will not have it restored for up to three weeks. City officials said city services it will take some time to restore and are encouraging people to find someplace else to stay until all services are restored. Federal and state investigators are still trying to determine what caused the fire that set off the explosion. Investigators also said they are taking a 3-D image of the crater to determine it's size and hopefully learn more about explosion. Authorities said there is still no inventory of all chemicals that were at the facility. Officials also discussed the memorial service scheduled for 2 p.m. Thursday at Baylor's Ferrell Center in Waco. The White House said Monday morning that President Barack Obama is planning to attend, though it is not yet clear if the president plans to tour the town. An apartment building just across the railroad tracks from the plant appeared to bear the brunt of the explosion, according to a pool report. The building's roof was collapsed, its windows were blown out and chunks of concrete from the plant littered the space between the tracks and the apartments. Assistant state fire marshal Kelly Kistner said the blast left a "large crater." Kistner said all fires have been extinguished at the explosion scene, and the remaining fertilizer tanks at West Fertilizer Co. are not a danger. "Several blocks we had projectiles or shrapnel that has been found of different sizes," Kistner said. "Smaller pieces have been found blocks away." The wave radiating from the blast also hit the nursing home across the street from the apartments. There too, windows were blown out, ceiling tiles were visible throughout the rooms and the red brick exterior was cracked. At West Intermediate School, a northern wall was charred and the southern wall showed structural damage. Crews from Union Pacific were repairing the railroad tracks, but reporters were kept from climbing the berm to see what was happening at the fertilizer plant. Above the berm, four heavily damaged metal structures were visible at the plant. More than 60 people are working in the blast zone for the federal Bureau of Alcohol, Tobacco, Firearms and Explosives and the state fire marshal's office. Kristner said officials have found the seat, or center, of the explosion, "which is important, because as we conduct our investigation we'll be working from an outer perimeter inward, from the least damaged to the greatest damage. So knowing the seat of that explosion is important." Robert Champion, the special agent in charge for ATF's Dallas office, said experts plan to get into the crater in the next couple of days and start digging it out "to see what transpired to cause this devastation." "It's a slow process, but we're getting there," Champion said. The town of 2,800 people was previously known in Texas for its deep Czech heritage — from the designs of storefronts in the town center and the names of streets and businesses to the "Czech Stop" bakery selling kolaches and other pastries to drivers exiting Interstate 35. On the first Sunday after a fertilizer plant explosion leveled part of the tiny Texas town, pastor John Crowder stood atop a long flatbed overlooking a hayfield and spoke to his congregation. Elsewhere, at the largest Roman Catholic church in town, the Rev. Boniface Onjefu's congregation on Sunday included firefighters and emergency workers who could be spotted in bright yellow jackets. Some of the people who attended Crowder's outdoor service wore T-shirts calling on others to "pray for West." "Every time I close my eyes, all I can think about is the explosion," said Edi Botello, a senior at West High School. "People running around. People evacuating. There was one point I couldn't even talk. I just stuttered." Crowder's First Baptist Church in West remained blocked off as investigators work on the scene of Wednesday's blast. So about 100 people sat in white folding chairs Sunday morning, while others carried their own. "We have lost our friends and neighbors," Crowder told the audience. We have lost the safety and comfort of our homes. But as scary as this is, we don't have to be afraid." "I stopped at the nursing home," Onjefu said. "I noticed a lot of people trapped. I assisted. I prayed with some and held the hands of some that needed comfort. I saw him in the eyes of everyone." "God heard our prayers and prevented another tank from exploding."